"It's time to get moving"
Please Note: This eBook is available in .pdf if you would like a FREE COPY please simply fill out one of the Online Forms on this website and ask for a copy and we will email you one. The "pdf version" has pictures too and we have received great reviews on it. We'd love to send you a copy for you to share with your friends, family and anyone you know in the Autism Community. Leave that place because through that child you can find real life, each attempt at a smile they make be it only once can touch your heart deeper than anything, the “small” accomplishments are extraordinary, you will find yourself crying out in joy at one accomplishment that you may have never noticed was made had they not been Autistic, you will take each bird singing for the opera it is, each breeze on your check as the breath of God, and when they do fall asleep you will look at their innocent face with their angel kissed eyes and feel a love you would have never known you were capable of had things been “the way they should have been” Your gift is before you, open it and run with it what an honor that we were chosen to raise the Autistic Angels of God. This life is not about what we want it is about what we do with what we are given……… To my Joshua this is how I feel about you I thank God for all of my children daily, this is to all of you. We at Stride 4 Autism want to acknowledge those who have given us so much moral and momentary support. To each and every one of you we are so touched that you were willing to open your hearts and minds to our cause, to actually listen to what we had to say you took time from your busy schedules to aid us in our quest. When we started we did not know how to ask "for help" from others about a disorder that is still a question mark and misunderstood. You opened your finances and your ears at the same time, you wished us well, prayed for us, and gave us useful advice. We only showed you a picture of our son Joshua and told you our story, our dream of what we wanted not only for our son but all those affected by The Autism Spectrum Disorder, we wanted and still do to give them a chance and we are so blessed that all of you gave us a shot. We would not be here 1 year later planning another fundraiser still going, the compassion to our organization that was shown not only from friends and family... those you would hope would be there... but from strangers whom we did not know, the parents or someone touched by a child diagnosed with autism and other disorders we were strangers to you physically but not emotionally through you and your encouragement we knew we were not alone it was wonderful. The small business owners in our town were so amazing in their support, my jaw is still hanging open not only were you all some of our biggest supporters, the way you care about what is going on in your community gives me hope. The big business supporters we know how many organizations come to you and ask for help daily, but you chose our "brand new" organization and helped us, we are so grateful that you took the time from the world of business to stop and smell the fresh air and gave us your support. The news stations and newspapers we would not have been able to succeed without all of you, you gave us the opportunity to come right into people's homes in their personal space and they listened to us on TV or read our stories in the newspapers we had an opportunity through you that was a pure gift! Our family, friends and church sisters and brothers you are our heart and souls you listened to our ideas that seemed impossible, you keep us in your prayers, you have stood up to the tasks we asked of you, and we are still wondering how we can ever thank you enough. The state city and state officials that opened your minds to our ideas and encouraged us to do them, having your encouragement meant our dreams could be reality and we knew we could do this. To God we thank you for our salvation through your son, your protective hand has stayed over our family and organization we do feel it, and we know "through you all things are possible!" To Lance no words can express to you how touched we are by your kindness, you took Autism on without a blink of an eye and are helping a family you did not even know do amazing things, you are an inspiration for what you do for charity and with a heart like yours I know many will continue to be touched and motivated by you, you are a real "pay it forward type of person" to us you are an angel............Thank you. Through all of you, we not only come from; The Biggest Little City in the World we believe we can become The Biggest Little Organization in the World!!! ACON – Autism Coalition of Nevada, Aqua Tech, Beyond Juice, Starbucks, 4 Paws, Wild Oats Food Store, Camp Lots of Fun, Renown Rehab Hospital, Macaroni Grill, Bully's Sports Bar, Dayton Valley Golf & Country Club, Denny's, Round Table Pizza, Empire Ranch Golf Club, Saturn of Reno, Wolf Run Golf Club, Ben's Fine Wine and Spirits, Wild Island Adventure Park, Buffalo Creek Ranch, US Bank, Albertsons, RAIN – Reno Autism Network, The Sign Shoppe, Grand Sierra Resort, FEAT – Families for Effective Autism Treatment, The Continuum, Sierra Speech and Language Group, Bob Beg Design, Nevada Wolf Pack, New Balance, Total Image Printing, First Baptist Church of Sparks, Wamsutter Community Church, Great Basin Credit Union, Sports West Athletic Club, Austin's Mountain & Country Food & Spirit, Ahhh! Massage, Wild Bird Unlimited, Birkenstock, Fast Signs, Blue Moon, Moana Nursery, Reno Cycling & Fitness, KRNV, KREN, KTVN, Reno Gazette Journal, Sparks Tribune, fox' Den Pizza. Diane Groth, Kim Mays, Louis Mays, Earleen Russell, David & Susan Semas, Paul and Kristi Heinman, Linda & Allan, Mr. & Mrs. Reed, Tom & Florence Byrnes, Monte Russell, Ted Ripley, Mike & Helen Pate, John Rassmussen, Daniel Morrison, Misty Hailey, Mr. & Mrs. Fauria, Ralph Toddre, Darryl & Debbie Handke, Mr. & Mrs. Buckley, Earl & Billi Pat, Richard Hand, Kevin Smith, Pam & Angelo Anastassatos, Eddie & Deborah Duffer, Earl and Connie Morley, Trey & Leila & Kelly & Taj, Rita & Gordon Paul, Scott Cahill, Helene Franklin, Greg Overby, Leon & Mercedes Kuhre, Dr. & Mrs. Larsen, Keith Smith, Terry Doelman, Melinda Mechum, Bob & Liz & Derek & Amy Tanahill, Rick & Chris & Cindy & Becky Silver, Shawn & Dawn Fuller, Eddie & Deb Duffer, Donna Bateman, Kendra Henry, Marquis & Kayla, Terry Happle, Missy Davidson, Taya, Amanda, Toni Richards, Kateland, Ken & Bonnie Porter, Jim & Nancy Close, Michelle Hesser, Bonnie Rudolph, Michelle Hesser. The US Department of Education, City of Reno Fire Department, Mayor Bob Cashell, Mayor Gino Martin, Senator Harry Reid, Senator John McCain. When Lori Kuhre first emailed me to discuss doing a car wash fundraiser for Autism in Reno and I could not have imagined a more worthy cause. As we began talking, I indicated my long-distance cycling endeavors and she noted her husband's heroic Stride for Autism walk. I thought, wow, now those are my kind of folks, what wonderful people. This is how Gary, Lori and Joshua, became the inspiration for this eBook project. We give this information to the cause of Autism, to you, wherever you are in the World. We wish you well in your fundraising endeavors and hope this eBook gives you a significant head start. Raising awareness and money for Autism is not easy, but it's something that the Autism Community must do, we must work together in this common cause. Now then, we have put this book together in basically 4-Sections. The first chapter is an introduction to the Spectrum of Autism Disorders. Chapter II discusses the inspiration of the Stride-4-Autism Foundation and Gary Kuhre's walk across America to raise awareness for Autism and health care insurance reform with regards to Autism. Significant strides have been made thanks to the inspirational leadership of Gary and Lori Kuhre in Northern Nevada. These first two short chapters give you some understanding into the importance of uniting a community and raising awareness as part of your fundraising endeavors. The remaining chapters explain How to Run a Successful Bike-a-Thon Fundraiser, and although it is geared specifically towards raising funds for Autism, this book can be used by any non-profit group of nearly any size. The final section of this eBook is the two Appendix Sections, with loads of sample forms, brochures and just about everything you need to get started planning your Bike-a-Thon Fundraiser right away. This eBook is free to the world and the authors give it away for the purpose of helping non-profit groups raise money and to raise awareness for Autism. You may re-print this book and even put it on your Autism Website to give away, we sincerely hope this work serves you well and we enjoyed the process in making it for YOU! I am a father of 6 children one of which has Autism and I plan to do whatever I can to help him and others like him! So, on June 9th 2007, I am beginning my walk alone from Sparks, Nevada to Washington DC APPROXIMATELY 2,800 MILES to raise awareness of Autism and point out the injustices being perpetuated on our defenseless disabled children. I want new National legislation written that will require insurance companies to cover care and treatment of Autistic children up to the age of 18. These children deserve our empathy, our love, and most of all they deserve their chance to reach for the brass ring. The CDC announced that 1 in 150 children has Autism and most insurance companies will not cover any medical care for them. The challenges the parents of an AUTISTIC child face is a daily struggle. Not to mention the cost of Therapy after a diagnosis is given. There is very little Therapy available in Nevada for the Autistic child. Of what is available the Medical Insurance Companies will not cover it, any of it. Once a diagnosis is given to your child the insurance companies send a letter to their policy holders telling them to “read their policy exclusions” which excludes Autism, Down Syndrome, and Mental Retardation from receiving any type of treatment or therapy. I hope to change that!! Once we found out Joshua was autistic I quit my job while my wife works to support a family of 6 (2 of our children have moved out already) and I stay at home with him and his brother Jacob (2 yrs old) to ensure they are well taken care of. It has been a struggle financially, but it is the BEST decision we have ever made. I found out that the state of Wisconsin has a very active Autistic insurance reform and requires that the Katie Beckett (Medicaid program for children with autism) must pay for ABA (Applied Behavior Analysis) therapy for autistic children. There are other methods of behavior therapies also (AIT auditory intervention therapy, Floor time, TEEACH, and Tomatis all of which have done well for these children) It should be our choice of what therapy we want for our children. ABA has been proven time and time again to help more autistic children cope and relate better than any medications, not that these do not help because they can but should be monitored closely. It is safer with good results for many to try and do a GF/CF diet and natural vitamins and probiotics to help heal these children from the inside out. ABA should be required to be paid for by insurance companies or Medicaid nationwide (maybe they could share the cost). ABA therapy costs approx $25,000 to $75,000 per yr for each child (depending on the area you live). So you see why the insurance companies do not want to pay, but typically the ABA therapy is only for 2 years and early intervention is the key!! Some adults who have autism, do not share the same views with ABA, therapies, or diets etc...and others do support them, we are not here to argue what does or does not work we believe each and every person is different and that each should have their own right to get therapies etc...whether one chooses to or not it should still be open not just a door slammed in their face. Our story began over five years ago when Joshua was born. My wife had a feeling right away that something was wrong. He did not progress "normally" he would not talk he screamed and cried all day long. By the time he was 3 he still was not talking and had been diagnosed as ADHD and developmentally delayed. We began Speech and Occupational therapy for him that our insurance paid for 2 times per week for 7 weeks. In January of 2006 he was re-diagnosed formally by a professional as Autistic. In March when the insurance company found out the “new diagnosis” they sent us a letter saying they would no longer cover Speech or Occupational therapies for him or anything else to do with his autism, and sent us a bill for all the speech and occupational therapy he had received since Jan of 2006. The bill was over $10,000 Thank God we were able to get Katie Beckett Medicaid for him. This startled me in to action, and what I found out is that about 93% of insurance companies do not cover things like, Autism, Down Syndrome, and Mental Retardation. I think it is deplorable that an insurance company will pay to send someone to rehab that is CHOOSING to abuse drugs, but will not pay for speech therapy for my autistic child that did not CHOOSE to be this way. So in short this is some of the fire that is driving me to do what I am doing (walking to DC to start an awareness for the need to reform our health care system. It is a sad day when you realize our children with disabilities are being discriminated against. We want to help by starting our own non-profit organization Stride 4 Autism for autistic children, setting up a scholarship funds through the organization and eventually opening a charter school. Autism effects one in every 150 children born in the United States, it is a very serious issues and one which must be dealt with. It is costing millions of dollars in each school system every single year and those costs are increasing. As school budgets are reduced so too is the money to help educate these autistic kids and health insurance is not covering these costs. What causes Autism? Well, it turns out that is 6.4 Billion Dollar question, the reality is that we don't quite know for sure. Yes, there are plenty of suspected culprits, such as the Mercury in vaccines, which you have probably heard about. Then there are questions of frequency pollution from such things like radars, cell phone towers and even pre-natal ultrasound use. Scientists suspect there is also a genetic component as well or at least issues with susceptibility from environmental affects, which also makes sense. Then there may be some correlation between the introduction of anti-depression drugs and the increases in the rates of Autism. Each of these suspected causes have scientific research papers backing their claims, along with other scientific research papers denying these causes. Food and diet play a large role in managing the effects of brain toxicity that research shows exacerbates spectrum tendencies. More funding and support are desperately needed in this area. With more mainstream knowledge available dietary intervention can play a more poignant part in the managing of such brain disorders; the quicker the intervention the less damage due to toxicity. Some scientists have proposed a theory that Autism is the human brain going through an evolutionary process. In fact there are so many theories to its cause, that it becomes pretty confusing for parents. There is currently no known cure for Autism although someday there most likely will be, today, there are only treatments, which make Autism livable for families involved and the individuals who have it. Still, the topic of cure and intervention success is highly controversial at this point notes Margit Barreras. The exciting part is people are openly talking about it and considering the research. More research needs to be done in order to come to a better understanding about how we might address this issue as a community. Now then, why would anyone call this the 6.4 Billion Dollar Question? Perhaps because that is the amount of money in research it will most likely take to figure it all out. Proportionally speaking Autism receives far less funding than other challenges we face. In fact, did you know that Autism effects one in every 150 children born in the United States, it is a very serious issue and one which must be dealt with. It is costing millions of dollars in each school system every single year. Some estimates place the cost to properly care for and educate an Autistic child around $85,000 per year, obviously more than most middle class families can afford and more than most taxpayers wish to allot. Autism is a complex neurological disorder that typically lasts throughout a person's lifetime. Autism now includes similarly related disorders that are classified as Autism Spectrum Disorders –ASD, also called Autism Spectrum Conditions – ASC and PDD or Passive Development Disorders? Perhaps you have heard of Asperser's Syndrome, this is mild for form of PDD. Rett Syndrome although rare and Childhood Disintegrative Disorder also fall within the ASD classification. Then there is Tubular Sclerosis and Fragile X Syndrome. Perhaps this web link may help you better understand? It occurs in all racial, ethnic, and social groups and is four times more likely to strike boys than girls. Autism impairs a person's ability to communicate and relate to others. It is also associated with rigid routines and repetitive behaviors, such as obsessively arranging objects or following very specific routines. It is devastating for families, many parents will never hear their child utter a word or ever hear "I Love You Mommy and Daddy” never receive a hug or a kiss from the child they love so much the child that is in their own world without knowing the love the family has for them nor understanding it. Many will need care for the rest of their lives, and never have a conversation with anyone they, will continue to live their lives through frustration and tears, but with therapies this can change. Unfortunately health insurance does not cover these costs and this why it's necessary to raise money. Autism is a complex neurological disorder that interrupts normal brain function. As a life-long developmental disability there is essentially no cure for spectrum disorders such as Autism. However with more research and education those with Autism spectrum disorders can learn to manage their lives and perhaps make better sense of the world. Many unanswered questions lie in regards to identifying triggers to autism spectrum disorders. No one case is identical. There are those whose autism is triggered by environmental toxins, others believe vaccines have played a huge role in the increasing occurrence of autism spectrum disorders. With further research we may come closer to putting together the pieces of this very intricate puzzle. Autism rates are on the climb, three decades ago the Autism rates were well under 1 in 2500 and in 2004 they were pegged at 1 in 182 and now a recent study indicates 1 in 150 children (age 8) in the United States. There should be alarm bells going off everywhere. As more and more children are born with autism, our society and civilization will get further and further behind if we do not keep up with challenge. Some folks in denial claim that we are diagnosing more kids with ASD, because we are more aware of it, and have classified other disorders in the spectrum and whereas this may sound logical on the surface, there is still the definite and undeniable reality that more kids than ever before are born with these disorders. The economic impact is huge, and comes a critical time for our already broken health care system, cash strapped school systems and shifting demographics. The baby boomers need care too, and with our aging population that is going to be a crisis in itself with shortages of nurses and care facilities, it's already happening. Add on top of this the increasing burden of autism rates. Autism research funding has fallen way behind and it needs a good shot in the arm to catch up, we are talking about 1 billion dollars in research funding right now, just to catch back up and then matching that every couple of years until we get a handle on it. Since many similar syndromes, which may or may not be totally related, but probably are have all been lumped together now in the same area of study and now they are calling them the Spectrum of Autism Disorders, this makes targeted funding a little more difficult. Each one individually needs to be further studied and it is time we found the direct causes or the combinations of causes that are being classified in the Spectrum of Autism Disorders. "If one in 150 kids were suddenly being born without their left arm, there would be an immediate public outcry and instant demand for billions of dollars in research, but since this is Autism and its out of the public mainstream, it goes unfunded and unnoticed"
A true a statement indeed and perhaps this truth is what brought about the quest to write this book. One recent study and survey showed that Autism affects one in three people in some way; in other words they have a family member, relative or close family friend that has Autism, so what is the hold up on the funds for Autism research? Are we to wait until this crisis, which many in the know are now calling an epidemic reaches 1% of our population, because it will. The costs of educating Autism kids is a huge burden on our school districts and it costs literally millions of dollars in each school year and many of these special educational need classes go on all-year overwhelming budgets. Autism kids require all sorts of costly evaluations and professionals such as psychologists, dieticians, neurologists, speech pathologists, pediatric occupational therapists, cognitive behavioral experts, disability consultants, and special education trained teachers w/assistants often 1 additional for every 5-8 students. She goes onto explain that, as autism spectrum disorder presents differently in those affected an individualized approach is required. There is an urgent need for more training and understanding in dealing with spectrum issues. More and more children are affected and need the appropriate learning environments in order to thrive. My own experiences have been frustrating. Even as an educator, educating my peers about the impact of neurological disorders has been very difficult. I presumed as a teacher my peers would understand my personal journey with my autistic spectrum child. Yet I found myself alone in understanding the needs of my child. Often an Autism spectrum issue can be disguised and not properly dealt with in a child who is classified as a high functioning autistic child. It is sometimes difficult to get much needed help when the child’s needs are not obvious to outsiders. It is challenging for educators to understand where the areas of difficulty lie and why. When a child looks "normal" on the outside very little consideration is made for how he or she functions on the inside. Many professionals believe that to properly educate an Autistic child correctly takes 20-hours of one-on-one help per week, critics of such expenditures often say; "who is paying for it?" To make matters worse when diesel fuel prices go up, the cost to transport these kids skyrockets too, along with the other transportation costs of the school districts. Next, budget cuts often nix High School Freshman sports, refuse to pay for uniforms, coaches or transportation, at a time when these regular kids need healthy extra-curricular activities to prevent ditching schools, drug use, teen pregnancy, truancy and gang violence. Thus, parents are fighting against one-another for funds that support their own children. When things like sports are cut from the schools budgets parents of sport kids complain and point to the costs of special ed. As the parents of Autistic Children ask for more one-on-one help in the classroom, the parents of the regular kids want more one-on-one computer training realizing that the job market will require computer skills, all this at a time when many school districts are cutting in those departments too. Often, school board meetings turn into cat fights, as the parents act more like ADHD children in war of words. And if that is not bad enough consider that many school districts get much of their funding from property taxes, and we all know about the housing sub-prime lending crisis, foreclosures and the drop in property values. Another huge issue is one of special education lawyers who have developed practices suing schools and staff for their handling of IDEA Law of 2004. A good book you should read is; "Educating Children with Autism" sponsored by US Department of Education. Now school districts and staff are so busy with CYA paperwork, and parents of Autistic kids so careful with what they say and what they sign, there is now a barrier of communication between the two, which does not do much to help the Autistic kids. The adversarial issues are not helping the situation much, although there are two sides to the story with rational and plausible deniability for all. As the school districts are forced to comply with the burdensome laws and provide "appropriate education for all" there is enough ambiguity in the word appropriate to tie up the education of any child in the modern court system and provide countless billable hours for any attorney that specializes in special education causes. But the parents of Autistic Children have rights like any other parent and they do not want their child thrown under the bus, can you blame them? "What if it was your child?" Asks one single mom at a recent local school board meeting, with the support and cheers of all the parents with kids in special education classes; many with kids in regular classes too. More money will have to be allotted in order to satisfy the law and the parents of Autistic kids, a group that can be very vocal when pushed around or backed into a corner. Still, we also see our schools in crisis, as teacher attrition rates climb, and shortages are occurring. The average attrition rate for new teachers is 50% in the first five years and there are in many places of shortage of special education teachers, who must go through much more intensive studies to get their credentials. Some see all these converging problems as a perfect storm, one that challenges the very backbone of our civilization; the flow of education. My own experiences with autism spectrum children opened my mind as a parent and an educator. My saving grace was I never gave up on myself, or my child. I continued to believe in us both and embraced her strengths and offered support in her times of need. I learned that the time your child most needs your support is often when you least feel like giving it. Remaining open to continuous learning helps me remain positive and enthusiastic about my child and her future. The educative needs of a child on the spectrum are diverse as are the needs of any child. However we must understand how much harder a child on the spectrum works to the same ends. They need relentless unconditional support to enable them to develop and learn to their potential. This type of consideration does come at a cost. Appropriate funding to support the needs of Autism Spectrum children is required to enable educators to provide thoughtful programming. As you can see there are several challenges to the Autism Spectrum of Disorders; we must find the cause and prevent these problems, we must educate the Autistic Children to grow up and become self-sufficient. The families of Autistic kids need your help, now more than ever. In the future even more assistance will be required in all aspects of Autism. It's time we do something about it. In the next chapter, we will introduce Gary Kuhre, a man on a mission, who did do something about it. Learn about the passion, courage and strength of a man who would do anything for his Autistic son. The biggest challenge with Autism is finding ways to raise awareness in a world, which is so busy and stressed out that life becomes a blur. Consider if you will the click-happy Internet generation, with the attention span of a gnat. Even the TV news now is down to 3-minute segments, this down from 7-minutes and down from 10-minutes, down from 15-minutes in just a couple of decades. Newspaper articles are cut short as well, why, because folks just want the; who, what, when, where, how and why, hopefully in the title, because they do not plan on reading much past the first paragraph. Yes, it's the 2.2 kids, white picket fence, college degree, credit card toting, mini-van crowd that is off to work, kids to soccer, and running some errands in order to get back and listen to the iPod, play video games, watch TV and instant message friends or surf the Internet. It's just the way things are today, so you ask where does Autism Awareness fit in and who is going to listen to the cry for help? Well, Autism is one of those things that when it hits your family, it stops you cold and it affects every single thing you do. Still, if you are not dealing with such an issue, you most likely would not notice and may not even care with all the distractions surrounding your present hustle and bustle world. And mind you, no one is complaining, as middle class America has a lot to offer, and of course, it is rather fortunate for us that we have all either been born into this civilization or have found ourselves here in the greatest nation ever created in the history of mankind. But there are some troubles in paradise and Autism is one very big problem, one that needs our attention. It is a challenge that is growing. So how do we bring awareness to the masses? And how can we bring awareness and raise money in the process? So, it's up to us to make those personal contacts, to get the dialogue going, and it is time that America had a national discussion on this very serious and growing problem. Of course, it's not easy competing for the attention of such a society, which is bombarded constantly with all sorts of other messages. Sometimes it takes something drastic to raise awareness, and well, that's exactly what one man decided to do, something drastic, something so over the top, that he made national news. I'd like you to meet my personal hero; Gary Kuhre, a man who set out to walk across the United States for Autism and to raise awareness to the fact that 93% of the Health Insurance Companies DO NOT cover Autism. In other words, if your child is born with Autism, good luck. Remember the cost per year to support an Autistic Child is about $85,000 per year, for most middle class families that is simply not an option; it's simply not economically feasible. Gary Kuhre discovered that the family's health care insurance did not cover Autism and the family discovered how much financial burden an autistic child cost. Rather than quitting in defeat and out of the love for his son, he dug down deep and his strength of character emerged. He decided to do something about it, yes a father on a mission willing to do anything necessary to help his son, even laying down his own life if necessary, if he knew his son could lead a normal life. It was out of this father's dedication, that he was willing to endure the ultimate test of devotion. One, which he was quite certain would bring awareness to Autism, indeed it was "a test of will" like no other had ever dreamed. He would walk across America from Reno to Washington DC and as you know Reno is further West than Los Angeles, due to the shape of the United States and the curvature of the Earth. His perseverance and commitment to the cause of Autism paid off. Not only did his walk invigorate the Autism Community, but it also made headlines and prompted two standing US Senators to contact him; Senator Harry Reid of his home State of Nevada, and Senator John McCain of Arizona, who is now a Presidential Candidate. The Governor of Nevada also got involved and opened up serious dialogue. Perhaps, it was Gary's upbringing or will to press on and never give up that prompted him on such a journey, he refused to give up on his son and now has become one of the strongest advocates for Health Insurance reform for Autism. In a modified customized cart he set off step-by-step towards Washington DC, an estimate distance of about 5 million human strides, and although in the end he was unable to complete the entire journey on the first go around due to unforeseen circumstance, he does dream of the opportunity to complete every single step. During his quest, step after step he became even more committed than the last, the power of love for his son and family and refusal to accept anything less, a dedicated father on a mission. The results of his quest and bold statement have created a never ending forward progression for Autism awareness. Gary and his beautiful wife Lori founded the Stride-4-Autism Foundation an official non-profit group used to raise both funding and awareness for families that are dealing with Spectrum of Autism Disorders. They have helped unite the community and have brought awareness to the state with regards to Autism and continue on this mission each day, as they lead by example. They work tirelessly for the cause; planning fundraisers, gifting monies and spreading awareness to all they meet. Are their efforts in vain, no not at all, in fact, their strength shines through, their commitment is making a difference; it's accumulative. Their personal sacrifice for their son and the Autism Community is catching the attention of new folks each day, with each event, fundraiser and each new personal meeting, their message, our message for Autism is reaching out. Lori and Gary have been working with the community and other non-profits, joining together and networking to create win-win situations throughout the region. It is easy to clearly see they will accept no obstacles in their way; awareness for Autism in Northern Nevada has arrived. What can we learn from this dynamic team and loving family? We see that all is possible and that it can be done, and by following their lead we can duplicate these efforts across the land and bring power to the people of Autism. Luckily for all of us in the Autism Community, Lori has documented Gary's Walk, and their Stride-4-Autism Foundation efforts every step of the way. And like a virtual digital scrap book has posted these efforts, with all their trials and tribulations along the way. It's all there; the joy and the laughter and the pain and the sorrow. The Kuhre's have opened their hearts to the Autism Community and the world in order to raise awareness. Their website tells the whole story through a series of blogs, informational pages, supporters and abundant resources. If you ask the Kuhre Family; what's next, I have no doubt that Lori, will rattle off several things she is working on this week. Although Gary and Lori have done so much to raise awareness and increase funds to help the Autism Community, this is only the beginning. Their inspiration is a gift to all families dealing with Autism. Ever since Gary Kuhre's incredible stride-for-Autism walk pushing the specially adapted cart across the states, the Stride-4-Autism Foundation has set out to raise money for real families and real needs, families that need assistance and have nowhere to turn. The costs for such essentials are outrageously expensive, treatment can run up into the thousands extremely quickly, and then there are the incidentals, things that all children need, things that Autistic Kids often never get to experience. It is this mission that propels the Stride-4-Autism Foundation forward. In fact, this eBook was commissioned for this very purpose, to help other families and groups in the Autism Community raise money and awareness in their areas and regions. Together we WILL make a difference, just like Gary and Lori have with their unbelievable strength and commitment. We realize that not everyone is able to duplicate the heroic efforts of Gary Kuhre, in his ultra endurance walk, but we can use this as our inspiration as we plan events and fundraisers of our own. And with that said, let's begin with a simple fundraiser that you can do locally a Bike-a-Thon. This is a complete plan for any group or non-profit that needs to raise funds. In this plan you will see how easily you can adapt it for a walk-a-thon, or even a swim-a-thon. We choose a Bike-a-Thon for this eBook because the Stride-4-Autism Foundation was working on a Big Bike-a-Thon event at the time this book was written, if you are considering doing a Bike-a-Thon then please continue reading. No one can deny that Lance Armstrong has been an inspiration to all, and perhaps one of the greatest athletes of our time, but his commitment to excellence goes far beyond his consecutive victories in the Tour de France. His work in raising awareness and money for cancer is a feat that has given hope and strength to so many. Perhaps we too should follow this yellow jersey to raise awareness and funding for Autism, as this growing problem shows no sign of slowing. Often we see large organization like the American Cancer Society, American Heart Association or HIV/AIDS Foundation do walk-a-thons or bike-a-thons, and there is a really good reason for this, it's because they can generate huge amounts of money in a very short amount of time. And they are able to do this with each participant putting in the leg-work; getting pledges, donations and support from their social networks of friends, family, school and business contacts. Walk-a-thons are often preferred because there is less risk of injury and participants can walk around a track or on a short route where they can be constantly monitored, given water and watched for safety. Bike-a-thons are generally spread out with much further distances, and they often can attract more seasoned athletes, along with less advanced riders with regards to skill levels. If one looks at how bike-a-thons work and why they raise so much money, it becomes readily apparent that it leverages the power of numbers. You see, people want to do something to help, but feel somewhat helpless against such a huge challenge like Autism. But by showing up in support to help raise both awareness and money, a bike-a-thon gives them an outlet. People feel like they are doing something about it, rather than feeling hopeless and it turns out to be a win-win situation for all. Luckily, putting together a bike-a-thon is not such a difficult task, in fact, of all the potential and possible fundraisers it ranks along with some of the easiest and it generates quite a bit of money. That is if it is well-organized, pre-planned and strategically coordinated. Hopefully this eBook will assist you in carefully considering all the details so you can have a successful bike-a-thon and raise the much needed money your non-profit group needs to tackle the Autism challenge. In the Appendix Section of this eBook you will find all the forms you need to run a successful bike-a-thon fundraiser for Autism. Lori Kuhre has spent countless hours creating these forms for the sample "Bike-4-A-Cause" event in Reno, NV and she has decided to share all that she has learned the process of planning this sample example. All the forms she created and all the wisdom that only experience can bring in hopes that her efforts can be duplicated across the nation to help with Autism are seen in her work. 1.) One rider starts at the Border of Canada and US and rode 800-miles to Reno. 2.) Once that rider reaches Reno, there is to be a pre-scheduled Bike-a-Thon on Saturday. 3.) The more advanced riders who want more of a challenge join with the solo-endurance rider to ride passed the State Capital of Nevada, Carson City to make a statement and then ride on to the nearby border of California on highway 395. The solo rider then rides to the Mexican Border. Non-profit groups throughout the city are allowed to sell pledges for the solo-rider under a special deal enabling all these local community groups to keep half of the money. The synergy this created in Reno [known for its slogan; "The Biggest Little Town"] fostered a huge word-of-mouth effect and is to give confidence to all those selling the pledges and those who offered to pledge. Indeed, we show in our example that is comes at a perfect time when general donations for the city's non-profit groups were sharply down due to a recent sluggish economy. The news stations, newspapers, radios will all cover the story and the pre-publicity helped immensely in giving awareness to Autism. This way the proper kudos will be given to all the small businesses, corporate sponsors, political influencers and the many non-profits and selfless individuals who participated. One of the main factors in Autism non-profit work is to bring awareness; the other of course, is to raise money, because without it things will not get done. A city or town uniting in such a common cause alerts the 'powers that be' to the reality that this is one issue, that needs support. And to that point, it is just amazing how much support comes when the local Autism non-profits are leading by example and giving their 110%. Long Distance Endurance Cycling is not for the week of heart and it takes a special mindset to ride for days on end at 150-miles or more. But it for this very reason that it also makes a great fundraiser, as the endurance rider(s) have ample opportunity to use their "test of will" for fundraising. I cannot think of a better cause than Autism. Long distance bicycle treks for a cause are able to harness the power of publicity and thus, it makes pledge drives just that much easier. Of course, we all know that nothing good in life is easy, so with that said maybe we might discuss the philosophy, theory and some strategies for a long-distance endurance cycling fundraiser. There are several types of endurance cyclists and each has a slightly different mindset. Let's take the solo-endurance rider for instance; they like to go it alone, call their own shots, ride on their own schedule, rest when they feel like it and modify their routes as they go based on how they feel that day or what they wish to see, as far as terrain. They have themselves, their own minds and do not long for a companion rider to share it with, for them it is a "test of will" or a badge of honor and it really does not matter what anyone else thinks of what they are doing. If your Autism Group is looking for a solo-endurance rider (roadie – bicycling on roads), then they are not difficult to find, ask any bicycle shop who the solo-endurance riders are, they know them by name. Indeed, this is only one type of cyclist, others are tourism cyclists, and they like to go in small groups or pairs and stop and smell the roses along the way. Some are very athletic, although most take it easy and really just enjoy the freedom and the fresh air; these types of riders can also make wonderful fundraiser participants for a long-distance money raising endeavor. Then there are the team riders, who like to really crank and enjoy going with a chase team or "sag wagon" (cyclist slang for the chase car). Riders like this, just ride, hard and fast and allow the team wagon to give them food and drinks as they ride or change out flats or do repairs. The sag-wagon, would pick them up at the day's final check point and take them to a local hotel and bring them back to that point for the next day to start again. Back in the early 90's I made a ride from Oregon to Mexico to raise money for Special Olympics and although I was a long-distance runner and not a cyclist, I was able to put in several 200-mile plus days. On one ride, I remember that I rode for 21-hours straight and you might have guess, I nearly died, as I hit the wall (a term marathoners use) or bonk'ed (cyclist terminology). I was literally a pedaling zombie. So, tired I could not dismount the bike without laying it down, then so tired and wobbly, I could not get back on to ride. A victim of my own ego and will or optimism and perseverance, nevertheless, it was that adversity, which summoned a deep commitment to never give up and continue on the next day for another 17-hours ride down the California coast. The reality is that no matter how tough, strong or in shape you are, there are limits, Mother Nature and the need to eat and sleep, those needs are real. So, my advice to anyone attempting an ultra-long-distance endurance event like this; be prepared. Having a chase team or sag wagon is a wise idea, but let's not forget we are riding to raise money for Autism, not spend it on a cross country bike riding vacation! Yes, I did finish my ride for charity that year, 6 and half days, and almost 1300 miles. For a seasoned long-distance runner at age 25 that was not too spectacular, and with that said, remember if you are in your 40s, 50s or 60s, well let's just say, you are older and wiser, so use it to your advantage. Now then, considering these concepts and knowing that the fundraiser you are planning cannot fail, it might make sense to look into some other options, such as a sponsored tour, such as the Ride Across America or a few top notched local riders with a small chase team. Don't get me wrong, a solo-rider can get it done and for a lot less, and if he or she plans the trip well and uses an ATM or Credit Card, chances are they can stay relatively light-weight and click off a good chunk of mileage each day. There are hundreds of people who have ridden all the way across America, from coast-to-coast this way, thanks to convenient stops along the way and the new high-tech bicycles that were not available just a couple of decades ago. Perhaps the most important aspect of a long-distance bike riding fundraiser is to choose a safe route, minimize the hill climbs and try to use the prevailing seasonal weather to your advantage. I.e. try to ride with the wind, not against it. It also makes sense to use routes that are bicycle friendly and have bike lanes and/or shoulders for safety. Of course, this is not always possible, but it makes sense to try to minimize the risk, as much as possible, by stacking the deck in your favor. It should also be noted that each state has its rules about riding on freeways and you must obey these laws, or a State Trooper will pull you over and have you ride potentially hundreds of miles out of your way, easily costing you a day or more out of your schedule. When choosing routes you must be cognizant of human automobile behavior, and if you are planning on riding through the night to get away from the heat of the day then Friday or Saturday Nights, are out of the question and three-day weekends are not a safe bet either due to increased traffic and drunk drivers. Believe it or not there are often bicycle touring maps available for such long distance rides and most bike shops can be a wealth of information in explaining the safest routes through the state. One set of maps that I highly recommend are the "BikeCentennial Routes" as they have all sorts of information on them and they will keep you off the most dangerous roads in favor of roads that offer buffers of forgiveness (big shoulders or bike lanes). Also available now are Cyclist GPS gadgets that attach to the handle bars, these come in handy when you need to change your route, it happens. On my long-distance bike ride down the California Coast, I was able to locate a couple of very tiny side roads to get me around the washed out PCH (Pacific Coast Highway) when the detour showed about a 30-mile detour, that would have taken me up about 1600 feet in elevation, pretty much ruining that days mileage. Luckily, locals helped me out on that one. Today, a GPS device would have shown the alternate route, without even breaking my stride. Garmin makes several very lightweight and durable GPS handlebar-mount devices, with backlights for night, which come with an array of options depending on your needs. For around $300-400 you can buy a Garmin GPS 605 and for $100 more order a chip from their website with all streets in North America. The Garmin 705 Bundle Model, which runs between $600-700 comes with cadence and heart monitor for optimum efficiency and performance, and comes with all the North American roads, plus the basics that measure distance, speed, time, etc. Another very serious issue is crossing large expansive cities like Chicago, Los Angeles, Houston, Dallas, Denver, Atlanta, New York, Boston, Phoenix, Orlando, Miami, Seattle or Kansas City during the middle of rush hour, just forget it, it's not worth dying for, wait out the traffic or consider a bypass route that will take you around the city, before you even get within 100-miles. Local bicycle commuters know the danger points, you don't. Additionally, you will avoid road debris that could flatten your tires. I can tell you this, I rode for over 1000-miles without a flat tire down the Oregon and California coast, but as soon as I hit Santa Monica, Los Angeles, and Orange County, I had three flats in less than 120 miles, not funny. Optimism is important, but "will" is omnipotent. And the weather is completely without emotion, it does not care who you are or where you are from. You will most likely experience heavy winds, supreme heat and near freezing nights. Depending on the region you travel and the time of year you might encounter rain, hail, sleet, black ice. You are at risk of heat exhaustion and heat stroke and at other times hypothermia and it's all real. Therefore you must plan your journey carefully and understand prevailing seasonal weather, and still you can never be sure. Thus, you must be prepared for anything, and even expect it. Remember the weather is not at your mercy, rather you are at its mercy, so you must have the will to overcome, to press on and commit to never giving up! A ten mile per hour headwind can cost you an hour or more at the end of the day and add 20% to your fatigue factor, meaning you will have exerted more energy, spent more time and will pay in sore muscles. Now consider a 20 to 30 mile per hour headwind or severe cross-wind and you can understand the seriousness, add in some rain, sleet, icy conditions, long uphill climbs and/or extreme cold and it will test your soul. Luckily, you are riding for a good cause, something bigger than yourself, and perhaps that along with some help from your inner will can get you through. Still, it makes sense to be prepared for anything within reason. Yes, you must go light, but when you are in the middle of nowhere, there are things you will need and would give just about anything for. So, here is the deal, we are raising money for Autism and creating awareness right? Well then, let's concentrate on making money, not spending it on logistics. In other words, find a rider that already has a bicycle, and pay for the tune up at the end of his ride. Do not go out and buy a brand new bike. On my ride from Oregon to Mexico, I started on a brand new SR Pro-Touring 15-speed. At that time it was the latest in touring bike technology, when I was done it was junk, literally ready for the bone yard. In fact, the bicycle company that donated for the ride did not even want it back, instead they made me a super deal to buy it cheap after the tune-up. The funny thing is; I never wanted to see that bike again, as long as I lived after that ride. Not that is was a bad bicycle, indeed, at the time it was state-of-the-art, it's just my rear end was so soar, by back was so tweaked and I had new muscles surrounding my knees that I did not even know existed. I just wanted a warm bath, massage and a memory erasing machine, seriously. Glad to have overcome adversity and it is wonderful to have attained that level of strength of character, but, I had so much character at that point, I should have bottled it up and sold it. So, let's face it, riding across large expanses of our nation on a high-tech bicycle is not free or even cheap. Many hotels run well over $100 per night and if you check in too late, that does not necessarily mean you can sleep-in late either. Sometimes if you are avoiding weather it pays to ride through the night until 10 AM, check in time at most hotels, then crash and sleep for 15 hours and ride all night and all day and all night again. Each time you are saving money and covering more distance. This is of course, if you are a young buck, for us older folks that might not be an option. But, it is possible with enough power bars (a case), bananas, water, and trail mix. Here is the thing, if you are setting out to ride let's say 270 miles in one sitting, you need to break this down into 3-rides of 100-miles, yah, don't worry, I understand the math there, it's just that last 70-miles will feel like 100-miles anyway. Now, you will need to stop and rest every hundred miles and stretch, walk around, jump up and down, even beat your head against the pavement, why am I doing this again? "Oh yes, Autism, a great cause!" Then rehydrate and load up on carbs and calories, because you are going to be burning some 4,000 to 5,500 calories per hundred miles, so just eating enough is going to be the big challenge. And like I mentioned before, no matter how tough you think you are, believe me Mother Nature just doesn't care, you'll have to prove it to yourself. By riding more miles and sleeping less per day, you can cut your expenses by half. Another way to cut costs is find like-minded folks along the way that will put you up for the night along your route. With the rate of Autism what it is there are bound to be friends of friends that are more than happy to help out in the cause. A good night's sleep, good meal and a little bit of encouragement can go a long way in fighting fatigue and maintaining a positive attitude. Also, I think you will find that most everywhere you go, restaurants, coffee shops or small business owners will be more than happy to fill up your water bottles and often kick-in a little snack, take it and say; "Thanks!" You'll need all the food intake you can get on this journey. One thing you will learn as you go; conserving energy is conserving money. That old saying; "Time is Money" is also apropos to long-distance endurance cycling. For local bike-a-thons such as the one we use in our example or sample plan; Bike-4-A-Cause around Reno, NV; the route is only 23-miles long (the McCarran Loop), it's basically a marathon on a bicycle. Just about anyone in reasonable shape with a bicycle can do it, using just about any type of safe bike. However, for a long-distance bike ride of 50 miles or more; or an ultra-long distance ride of 100-miles plus, it will take a cyclist with a quality bicycle and some training. So, let's discuss the type of bike and the equipment needs that will be required for a successful long-distance bike-a-thon for your Autism Fundraiser. First, we must determine how far the ride will be, how many days it could potentially take, if there will be a chase team and the skill level of the cyclist or cyclists. If there is going to be a chase team (a van or RV) with necessary spare parts, water and food, then its best to go as light as possible for maximum speed and efficiency, perhaps an all-carbon bike. However, if the ride is a solo ride it may require a different strategy, such as a much stronger bike, one which can handle luggage racks and extra-weight. One with puncture resistant inserts in the tubes, more rigid construction and ultra-strong components. Also one with comfort in mind, because out in the middle of nowhere, there is no turning back if your rear end, back or body just can't take it anymore. When Lance Armstrong was asked for advice, he said; "Get a comfortable seat!" Yes, there is a lot of wisdom there and so we do recommend a "Gel Seat" and if you are thinking that they weigh a lot, you are correct, but after two days riding, you won't care. In fact, it is probably better to skimp on the bike than the seat. In my opinion, I believe it is best to go as light as possible within reason, so a full-carbon or partial carbon composite and alloy bike might be the best bet. The shifting components are important and it is a dream to have everything working perfect, however on a 1,000 mile or more journey, you will find things become mal-aligned and miss-adjusted and thus, it might be wise to seek a local bike shop out about every 500-miles or better yet learn how to true your wheels and tune up the derailer and shifting components yourself and always make sure your tire pressure is at optimum. It is recommended for this type of riding that you have a minimum of 2 water bottles (quart size) if your leg is less than 60-miles and that is pushing it. If you have legs longer than that you need a third water bottle or a back pack water system. 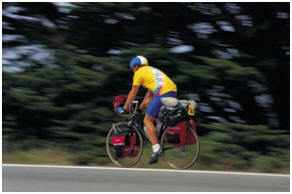 Some long-distance solo-endurance riders have three-water bottles mounted to the frame and also carry a back-pack water system. The back-pack water systems come in such sizes as 60, 72 and 100 liters. If you get a 100-liter unit, make sure it comes with an extra-strap for your waist (most do), you'll need the extra support to keep it in place while you ride. These pieces of equipment are a must and although toting around adds a significant amount of weight, you cannot ride without it. Thus, it makes sense to have extra water bottle capacity, even if you will not need it between certain check points along the way. Spare parts make sense, for instance an extra tube, tool kit and tube patch kit. Depending on the distance, perhaps 2-tubes and an extra tire too, there are times and I've heard stories, you just never know where Murphy Lurks (a reference to Murphy's Law), some cyclists refer to these purveyors of bad luck as little Gremlins, suffice it to say; "It Happens." Be sure to also take chain lubricant and a little grease, especially if you are riding in rain, sleet or a salt air environment. Treat your components as if your life depends on them, because actually it does. What about bicycle cargo gear? Yes, there are many different types, but you should be careful which set-up you choose. Loading too much on the front wheels can cause problems in steering at slow speeds and even high-speed wobbles going downhill on a bumpy surface, which you will encounter along the way somewhere if there are any hills at all. Some touring riders have complained that they catch the cross wind and make things quite difficult if not dangerous. Handlebar cargo systems are nice, as they can be used to hold maps, instructions and easy to get to food supplies like bananas, fig bars, power bars and other high-calorie, high-carb nutritional foods, but a word to the wise, don't overload these cargo bags, it can make steering tough and cause you to take a spill. How do you suppose I know that? Ouch. Most of the handlebar cargo packs are now much smaller, probably for safety and they are fine if you do not overload them. Try to find the most aerodynamic design to cut down on your relative wind footprint to reduce drag. Rear mounted bags are not a bad option, but keep the load low using panniers. You see, if your gear gets too high, then your load can shift and drag against the bike or worse make you top heavy and threaten to topple you and ruin your whole day. You can put a small bag on top of your pannier platform, which will also prevent water from "rooster tailing" behind you as you drive thru puddles or in the rain. At high speeds the dirty road water will shoot right onto your back, making for quite an irritating ride, but with a small pack on top of the pannier platform this problem is solved. Still be aware that you need water proof cargo units, otherwise everything you take with you will be soggy, moldy and wet. It is difficult to keep any load in place on a bumpy road, in high-winds or on high-speed down-hills. It's better to over secure your load, than risk cargo failure. Before you start and at any breaking point, double check your load. If you are going to camp out in the open then take the lightest possible sleeping bag and have it ride directly behind you so that you can block the wind otherwise there is virtually no chance of it staying where you want it to be during a 100 plus mile leg. One bit of advice for those who choose the pannier systems, make sure your system secures both to the seat post or frame on the top and the rear axle frame assembly on the bottom. Why? Well, because most of the pannier units can hold a lot of weight, 25-35 lbs, but if your system only connects to your seat post and it is made of carbon composite, it may break, it's happened to me before, so head that warning. Additionally, if you have a carbon composite seat post and wish to run with a pannier cargo system, then change out that seat post for an alloy post, for about $100 you can get a stronger alloy seat post which weighs about the same amount anyway. If you are going to ride at night you need to have good lighting, both rear to warn motorists and front lighting (headlights) to see the debris, potholes and road hazards ahead of you. There are several options and most of the bicycling lights now use LED lights, due to their low wattage requirements. There is a big difference between the functionality of these lights and things you need to consider. Many of the smaller lights use AA Batteries and they only last about 24-hours of run time. Some manufacturers advertise more, but generally they base this on a flashing white strobe for the run-time, which you cannot use while riding long distances. You need a steady light. Now realize that as the batteries die, you have to dispose of them and buy new ones, this can get costly and you have to stop and go shopping and that takes time or carry spare batteries which costs you weight, remember you need to stay as light as possible. Some riders like the high-tech friction lights that work off the tires, but putting a drag on your tires slows you down. These lights are much more powerful and luminescent, but certainly not my first choice. The AA battery lights are decent and there are several brands, Trek makes one which has five LED lights and has a luminescent rating of 60, most of the 3-LED light units are 40 or less on the luminescent scale, neither of these works at speeds of 20-miles-per-hour or more on a moonless night. Now for riding in central twilight or as the sun is going down, they work wonderful and are legal in states that require bicycles to have lights if they ride at night. There is another brand called Tri-Newt that has a LED light that scores 480 luminescent on the scale and has an ion-lithium battery, which Velcros to the top bar of the bike frame. The ion-lithium battery is re-chargeable, but this also means you need somewhere to re-charge it and you have to tote around the recharging unit. The cost of this lighting system is steep, $300-400, and the company has another similar unit that scores 200 on the luminescent scale for under $200. One cool option with these lights is that you can mount them on your helmet and run a cable to your water-backpack system where the ion-lithium battery is placed. It goes without saying that you'll need a helmet for such a journey, and there are many riders who decry this. In many states it is now a law, personally, I do not need a law to make me wear a helmet. Helmets are a must and as one Motorcycle Racing Gear company advertises; "How much is your head worth?" Precisely, and so, do not skimp on quality head gear. There is something else you should know, once you crash your helmet is pretty much toast, so do not believe that you can go pick up a bicycle helmet at a thrift store or garage sale, if it's got scratch marks on it, it may no longer have structural integrity. Your helmet must fit properly or you will have problems with it, as it pulls down or back when going down hills at high speed or gives your head aches along your entire route. Do not be surprised to find a good helmet running you up over $100. Likewise, do not be surprised to find good sunglasses, or protective eyewear costing in excess of $100 either, and believe me the first sunny day you are without them, you'll become a true believer in their value. One dust storm can cost you a lost day and three bottles of eye drops for the next week. If at all possible buy the helmet first then eye glasses that work with it and fit as one. The straps of your helmet will hold your sunglasses or protective eyewear in place, but an improper fit can cause your glasses to push into your head and cause migraines or move around as you ride, causing an unsafe condition. You will generally use at least two water bottles per 50-miles minimum and on a hot day you will most likely need more, if you notice you are no longer sweating on a hot-day, it's too late you are rapidly approach a dangerous dehydration point. If you have longer than 50-miles between stops, then you will need an extra water bottle (3-total) or a back-pack water system, which are really great for 100-mile stretches with nowhere to stop to refill. If you find yourself hallucinating or your mind drifts into trying to calculate the distance to Alaska and considering which route to take to get there, you are most likely suffering from heat exhaustion and you need to power back up, it's time to stop and re-hydrate your body. Even if you start out with a hearty meal prior to your ride, you must start eating something at least by mile 30 or 40, even if you are not hungry, sure you might be able to go for 55-65-miles, but by then it's too late and your body cannot catch back up even if you stop to eat and pack in the food like a gorilla. It is important that you do not let yourself get behind the nutrition curve, it's a living hell trying to get back and still maintain your daily pace and mileage goals. When you are done for the day, the first thing you want to do is roll over and die or sleep, but you need to stretch and wind down, so your last five-miles ought to be very easy, freewheeling your peddles backwards, standing up on the seat and coasting and moving your sore muscles. Once stopped walk around a bit and stretch for 10-15 minutes, clean yourself up, soak in the tub or take a warm shower. Amazingly enough you may not be that hungry, just tired as hell, yet energized, it's a weird feeling, but you have to force yourself to eat, go for a complex carbohydrate meal, pasta if it's available. Then get some rest, tomorrow you are going to do it again. What should you eat while you ride? Anything you can find, everything if it is available, the problem is that you cannot possibly eat enough to catch back up and set yourself up for tomorrows ride, whatever you put in, your body will use and thank you for later. As with almost anything, the amount of preparation you do will be in direct proportion to the success of your Bike-a-Thon fundraiser. Pre-planning preparation is the key difference between just another fundraiser bike event and an unforgettable experience, which will be remembered all year until next year's annual Bike-a-Thon Fundraiser. Be sure to browse through all the forms in Appendix I, which Lori Kuhre has carefully prepared so you can get an idea of how things work and how to set up you fundraiser planning and committee team. Perhaps the single greatest reason for putting this book together is the fact that raising money for Autism is not easy and planning a successful fundraiser is a lot of work with no guarantees. Our mission of course, is to take as much of the guessing out of the equation as possible, giving you useful information, tips and experience learned from actual trial and error. If we can save you from the mistakes we made along the way, then you are that much further ahead. Although a Bike-a-Thon is one of the easiest fundraisers, probably about as much work as putting together a car wash fundraiser or silent auction, it still has its idiosyncrasies and important details to consider. One issue you will most likely have to deal with is getting a city permit to host your fundraiser event. Generally, these permits are not that difficult to get, but do not be surprised to find yourself battling a little bureaucracy along the way. You may be required to have "event insurance" which you can obtain from a local insurance broker or if you are part of a large Autism Group, that might be a place to start looking for insurance resources. How much are event permits at the municipal level? Well, your city may have waivers for non-profit groups, so be sure to ask, some cities do. Most do not, so you can expect your permit to be anywhere from a nominal filing fee of $30-60 or somewhere between $100 to several hundred dollars depending on which city departments have to sign off on it. If your event will have over 100 riders or up into the thousands of riders, you may be required to close off roads, pay for off-duty traffic police, a cone-service and all sorts of other anticipated costs, which may be prohibitive or you may decide it's worth it, but this also adds to the size and complexity of your fundraiser planning. If things get too out of control, you may want to put yourself on the City Council Calendar to request a waiver of fees or funds from the city to pay the fees, after all Autism effects 1 in 3 people in some way and who lives in cities? People! This is one reason you need to schedule your Bike-a-Thon fundraiser a couple of months ahead of time from your actual first meeting planning date; rushing your fundraiser together can create problems down the road for your participants or riders. For instance, what if your route crosses state owned highways or uses a portion of them, well, then you may be required to get a state Department of Transportation permit too. Also realize that some roads are county maintained and you know how the government works, one more level of paperwork to forge through for you. Next, you will need permission from the property owner or major tenant to meet in their shopping center or industrial area that is along your route for the starting point. They may require certificates of insurance or additional insured certificates to protect themselves from injury lawsuits if someone falls off their bike or gets run over in the parking lot. Getting such permission might be easy, but could also take a week or two, depending on holidays and weekends. When planning your Autism Bike-a-Thon Fundraiser, you must understand that in a way you are competing with other non-profits for donations. Likewise whether you choose to address it or not, you are also competing for people's time, so you need to know what's going on in your city as well. If there is a Big Rodeo, County Fair, NASCAR Race, or an Air Show featuring the Blue Angles, then it could cut your participation and income from the fundraiser in half. Rather than compete with other high-profile events or fundraisers, you need to work with the community and pick a weekend that does not conflict in any way or a weekend which is not a major holiday, where folks already have plans for their 3-day weekend. The best way to insure that you are not competing indirectly with other big local events is to check the Calendar Section of your local newspaper. Are there any major community events occurring on the same day as your planned Bike-a-Thon fundraiser? A conflict may cause a decrease in the same day attendance and such a decrease could cause as much as twenty to thirty percent drop in your potential revenue. If, on the other hand, you coordinate a time, date and location that Corresponds to the other event, let’s say down the street a half a mile or less, you could add fifty percent more on-site same day donations and hand out Autism Awareness brochures to 1000s of more folks. So, don't compete with big events in town, work with the community not against it. What about rain or severe inclement weather? Perhaps you should have a rain date, make it for the following week or two to three weeks later, if that rain date conflicts with other big event dates. If you choose to have a long distance rider for advanced publicity, you can make a big deal about the rider reaching your city or half-way point and how unfortunate to postpone the event, thus, giving you even more advanced publicity for the new rain-date event. Now, you may also choose to accept the potential eventuality of a severe weather day and do it anyway, giving even more PR to the die-hard participants who battled the weather for Autism (rain or shine), so you can determine how you want to play it and what do about weather scheduling issues. A large scale Autism Bike-a-Thon is a huge undertaking, and you will need some help. You will need to delegate much of the workload, and you must follow up and make sure no one drops the ball, this means constant feedback and monitoring is necessary. Weekly meetings of the core committee team are necessary. You must make sure the members on the committee are go-getters, and indeed, you must know your limits and those of your fellow team members. You need to understand their family time commitments and issues. Most likely the most motivated Autism Committee members will have family members with Autism that come first in their lives and you need to consider this. Who should be on your committee and what tasks will they be assigned? Well, you need permits for the event, permission to use various pieces of property, business owner support, bike shop sponsors and corporate donors, as well as a printer and publicity people. These jobs require someone who is use to working with teams, doing Public Relations and has run large events before. You will also need two people to meet with other local non-profit groups and set up the pledge drive teams. Then these teams must be monitored, have the needed forms and have some training on how to organize their own group members to canvass and hit the streets. On your committee should also be some bicycle people perhaps an owner of a bike shop and one of the riders in the long-distance phase of the Bike-a-Thon. Generally, these types of personalities all work well together and that is a wonderful thing, which will make your job very easy. It's important that you set some ground rules that everyone can agree too, namely; no "blame games" and if someone is getting behind in their work load, they all agree in advance to come forward and ask for help, without fear. All members of the committee must realize that this event requires a 100% effort and failure is not an option With that attitude there will be a little stress, everyone must know that upfront. Riders and participants must have a helmet and a bicycle in working order, and you may wish to have a bicycle pump handy to assist folks to make sure they have proper pressure in their tires, as that is one of the most important key aspects to bicycle safety. Remember no matter how much money your group raises, the event will be considered a failure if someone gets seriously injured. Do not risk safety. You may wish to check with your local police department, as it may be possible to have a local community police advisor out for the event to inspect the participant's bicycles and safety requirements. This would be on a volunteer basis and participants could opt for the free inspection or choose not to. This will add credibility to your ride, and it is a fringe benefit to get more folks out to participate in your bike-a-thon. Folks that are there for moral support of a participant could bring their bikes for a free safety inspection, making it a family event. If your event is going to have more than 50 riders then you may wish to stagger the start times in order to handle the traffic. After all, bike lanes are not wide like car lanes and many bikes abreast could take up several car lanes, as well as the bike lane. By starting the more advanced riders or avid cyclists first, you can prevent the slower "fun run type" riders from getting in the way or losing their self-esteem due to being passed over and over again by the well-seasoned riders. Staggering the start also prevents bicycle pile-ups at the start or excessive passing, as faster riders ride into the automobile traffic lanes to get around the slower riders. These groups specialize in helping the community and they know the town and have contacts that go back for decades. Remember Autism is a serious issue and it affects us all. Often folks who feel put on the spot when asked to pledge will feel a little uneasy and they may not wish to figure out the math of what they will owe when the bike ride is completed and it is for this reason that the bike ride should be a an even number of miles. In our sample/example case the long-distance endurance ride was 1500 miles so if someone donated $ .01 per mile that would be simple right; $15. This is a nice even amount and if the pledge seller is in let's say the Boys and Girls Club, then the Boys and Girls Club would get $7.50 and the Autism Fundraiser gets $7.50 too. But what if the ride is 1347 miles, then you see the dilemma for some people? One strategy to overcome this is to have a small cheat sheet on the back of the pledge sheets or on a 3 X 5 index card that the pledge seller has, which shows how much will be owed, if in fact, the rider completes the full journey. Sometimes pledge sellers will hit their best prospects first, but will be shot down because they do not present the case for Autism correctly or they are too nervous, and since this problem is so common it makes sense to do a little role playing, perhaps make a short "elevator pitch" or written script to practice, something they can use until they get the hang of it. If a potential donor asks; "How much should I pledge?" then the pledge seller should have a brief statement of how much and why that is a fair amount, and what the money will go for, that is "IF" the rider completes the route or course. Once you have a good location and permission to use it for your event, next you need to put a person in charge of setting it up. Look, you must remember that the businesses that allowed you to utilize their property, assume it will help their business and bring them customers in trade for helping the community. But if you block traffic, cause people to leave the parking lot and cost the store owners sales, then you are biting off the hand that is feeding you. So, you need a person in charge of the event location, who can take charge and set things up as to not allow cars where the bikes are, and accomplish this without destroying the parking lot traffic flows. Parents will be dropping their kids off and their bikes, others will bring their bike and park their SUV, mini-van, sedan or pick-up and get on their bike to go to the sign in, and go to the starting point. You will need adequate over flow parking area and see that people indeed, do use it, rather than taking up spaces you need for pick-up and drop off or that customers need who intend to patronize the businesses in the center. It best to have a layout plan prior to starting and if you plan on having a police community service bike safety officer there, they too need room and they have their own way of doing things, understand this in advance. Lastly, and I cannot stress this enough, you need a dedicated cleanup crew, one which will not leave until every single piece of trash from the event is picked up. Every single piece without exception, no one should be able to tell that you were even there. "DO YOU UNDERSTAND - Swear to it, swear to it right now!" We did not write this eBook for folks to take advantage of the local business community or make a mess, respect this gift and the gifts of all who helped you along the way. By cleaning up your act, you insure that every business, which assisted will be there next year for you and for other non-profit groups who need a little help throughout the year. Think Community! One of our jobs when representing the important challenge of Autism is to send a message to the public, one which is easy to understand and gets the point across. Whether we are primarily focused on fundraising or launching a full-on publicity campaign to help move legislation, everything we do is being judged by society. In a perfect world our fundraising events would clear a million dollars, recruit 10,000 new volunteers and enlighten a 100,000 more people as to the serious nature of Autism. Yes, that would be our goal, and it should be our goal, yet at the same time we must realize we do not live in a perfect world, for if we did Autism, most likely would not exist. So, let's shoot for the stars and attempt to seize the moon. It is for this reason that we must consider that although this eBook concentrates on how to run a successful Bike-a-Thon Fundraiser and accrue the money we need to continue, we also have a responsibility to simultaneously raise awareness. So, you need to be thinking how we can merge these needs into a strategic plan that works. Now, despite what you might think, the media is run by people, folks who do have a bit of empathy underneath the façade of dirty laundry, controversy and mass media hysteria. They are real people, like you and you need to be thinking here. Treat them accordingly, as they can help make your fundraiser a smashing success or leave you hanging with lots of costs and very little revenue, without proper support. Did you know that Radio Stations are required to play PSAs out onto the airwaves? It's true, what is a PSA? PSA stands for ‘Public Service Announcements’ and radio stations have to do a certain amount of public broadcasting in order to satisfy their Federal Communication Commission (FCC) requirements. This is good for you because that means that they can announce your bike-a-thon fundraiser event on their radio station for all to hear. It’s basically free advertising for you; that is as long as it is for a non-profit group. To get this free advertising, call the radio station and ask for the community service desk or the public relations person. Make sure to list all pertinent information such as: who, what, when, where and how. You should be extremely nice to radio people because radio time is valuable and others groups also have requests for their events. Sometimes there are many more requests than available time. If a radio station has 26-non-profit PSAs in rotation, they may play yours a 3 AM twice a week in order to satisfy their requirement, meaning very few folks will actually here it. One thing you can do is to partner up with your favorite radio station and have them come to event with a live radio-caste on-site during the event. “Hi everyone, I’m down here at Gladiator High School supporting the Autism Bike-a-Thon and we have 100s of riders raising money for Autism Awareness, so come on down and join us, and bring your bike for a free safety check!" This will add additional folks who come out to see what's going on, may donate or even volunteer for a future up and coming Autism fundraiser event. I cannot stress enough that it is necessary to be very nice to radio station personnel. You will be glad you did. Usually they are personable, have high energy and generally very easy to get along with so this should not be a problem. Local cable television stations have local news. Your Autism fundraiser events make for some public interest, upbeat and positive news, especially the day of your bike-a-thon, when 100s of people show up. Better yet pre-event stories can lead to 100s of additional riders to come out and join in the festivities, and that means more word-of-mouth awareness for Autism and more donations too. It is important to have a newsworthy hook for a pre-event story, and Autism is full of stories of overcoming adversity and cherished moments that make you cry. Whereas you may feel reluctant to exploit such things, it is for a good cause and nothing develops more awareness than a personal story. Pre-bike-a-thon stories work if the reason for raising the money is newsworthy, Autism, which affects nearly 1 in 3 people in some way or another, is definitely newsworthy. This does not mean that all cable TV stations will be beating down your door to get the scoop, as it varies from station to station, region to region and story to story, what types of news they are interested in carrying during prime time. I can’t tell you what stories are newsworthy and which ones are not. You see, I have been involved in community endeavors all my life and I have had lousy stories on T.V. and great stories with no call back. You just never know. You might tell the cable station that both newspapers are coming out on Saturday to take pictures of your event. This will make them want to swoop the scoop and do a story before the event. This could also back fire if not done tactfully. Be careful. I can tell you one thing. If you have a three minute to seven minute segment on the 7:00 pm to 10:00 pm local cable TV news, lots of people will see it and it will help your bike-a-thon event's success. When you call your local newspaper/papers, ask if they offer free classified ads for non-profit groups. If they do, place a classified advertisement. If they don’t have free classified ads for non-profits ask the operator for the calendar section to list your event. If you did place a free-classified ad, then call back fifteen minutes later and ask for the community calendar section to get your event listed, but first read some of the other events so you can make it short and sweet and keep with their desired calendar of events format. Sometimes they will have a form to fill out. Have it faxed to you and fax it back. Be sure to check one week before your event to see if it’s going to be listed if you don’t see it listed to date. If they have a community calendar section and you will be listed, then call back the next day and ask for the newsroom. You should wait until the next day after faxing the calendar section request to call the newsroom about your story. Perhaps your group is raising money for a special trip for Autistic kids, a high-tech piece of educational equipment or an important event. These stories might be newsworthy. What are you earning money for and how much do you need? Maybe you can hit the front page. Wow! This will give you a big boost in volunteers and bike-a-thon participants, but if they refuse to do a pre-bike-a-thon story, be gracious. They may have too many other events to cover. If they have space for filler, you may be in luck even if you don’t hit page A-1. Lots of last minute events happen in the news industry, you never know. Maybe you don’t get a pre-event story, but they show up the day of the event for a story, this could really boost moral for all participants, plus raise awareness too. It also will help effortless pledge donation collections and it will make it much easier to get volunteers for other fundraising events later in the year or at next year’s annual bike-a-thon, so always be thinking ahead and work towards long-standing media relation with all local and regional media outlets. Word of mouth is still the best advertising. Your Autism Group’s members talk to lots of people each week. So keep this event in front of them, you'd be foolish not to, but remember you don’t have the only newsletter in town. All the service clubs in town, corporations, colleges, hospitals, government agencies, PTAs, and organizations all have newsletters. It certainly wouldn’t hurt to ask to have an article or a mention of your bike-a-thon event included in their newsletters, as well, even a one-paragraph mention of your event will help you. If every entry in every newsletter nets you five more participants or 10-more folks who pledge, this adds money to your fundraiser and increased awareness and future volunteers, because people are either voting with their time, or money. Indeed, the contacts you make and the goodwill you receive for your Autism organization is worth the effort ten-fold for later community projects and events. By networking with other people who care, you will better your chance of participating in joint projects, thereby elevating both groups. If a local corporation likes the PR value that you generate for them, in return you may find yourself being adopted by them as their favorite charity. Always and I can’t say this enough, look for the win-win in every phone call, meeting or discussion. Just as important as local club newsletters, the new wave of Online Social Networks can generate buzz, so fast your head will spin. They are truly a connected group and viral Internet marketing campaigns generate a life of their own. For bicycle fundraisers, groups interested in that subject, will instantly notify all their biking friends and those friends will tell others, and once it gets going there will be hundreds of potential new volunteers, participants and word-of-mouth salespeople. Even if you do not understand how this works, having a few young people on your bike-a-thon event planning committee can really be of value. Many folks loathe SPAM, I know I am one of them, but sending out an invitation to participate in a bike-a-thon for Autism to all your friends and then asking them to do the same is not SPAM, it's alerting folks to important information that can create awareness and generate money for a very worthy cause. If your core group and committee is made up of 5-people and your over all group has another 20, then you have twenty-five folks and all their contacts, friends and associates email lists. If each person sends out a mass email to 100 people asking them to do the same, that is 2500 emails on the first phase and it just grows from there. Also realize that some companies may be willing to put a message in the inbox of all their employees. This adds participants and donors, which have a steady job and can therefore afford to support your bike-a-thon for a cause. Not a lot of people know this, but there are online article submission websites that carry no fees and press-release websites that do not charge for non-profit groups. Simply write a 250-word article about Autism and the need for awareness and funding and in the by-line put a hyperlink to your Autism Fundraising website. Over the last 2-years, I have submitted thousands of articles to such sites and driven a lot of Internet Traffic to the various causes that I support using this method. Online article submission sites and press release websites often receive favorable ranking status with Internet Search Engines, one article submission website that I use most often is; www.EzineArticles.com . I like this site and websites like it because, Internet Newsletter (eZines) Editors will pick up the articles and put them into their circulation, and other websites will use the content, adding more links to your website and more traffic too. Also the articles go out RSS – Real Simple syndication, meaning that once published online, they spread around the Internet. Flyers are a great way to advertise inexpensively. For your bike-a-thon we recommend finding a local print shop that will advertise on the back of your flyers, with their company's logo on the front as well in trade for the printing costs or for a minimal charge. Go to soccer fields, softball games, office complexes, and talk to people and give them a flyer. Post them on bulletin boards around town, put them in the mail boxes inside real estate offices. If a bicycle shop is helping you or becomes a sponsor, hand out their flyers too. Ask Domino’s Pizza and other delivery companies to attach flyers to their boxes, ask grocery stores to put them in their bags at the checkout counter, and consider asking other food outlets and restaurants to stick one in each take out bag. By asking grocery store managers to have box boys put one flyer in each bag of groceries, you may reach 100s or even 1000s of people that might not have ever realized that your event was taking place. Perhaps you might try the local video store. In fact you should always be on the lookout for good locations to place flyers. Don’t put them on cars; that's a no-no, but anytime you find a good distribution point, think on it, if it makes sense without upsetting anyone, go for it, it never hurts to ask. Nobody likes junk faxes, but, you would be surprised how much support you can get from the local business community and large employers by calling them up and asking if it is okay to send a fax about an up-coming Bike-a-Thon fundraiser for Autism. Then fax out a cover letter with a pledge sign-up sheet and ask them to put it on the counter, believe it or not folks will sign up about 20% of the time. We always send out a thank you letter in advance for filling out the form and told them that if they filled out all fifteen lines with sponsors that their company would receive special recognition. Then when the fundraiser is completed, we will send a letter to the editor thanking each company by name and drop off a certificate too. It was quite exhilarating to find out that many companies not only filled out the form, but also called and asked for more forms to fill out. Some companies just added additional pages themselves and one person re-created our form using an Excel or Lotus spreadsheet and filled that out too. A few companies reminded us after the event that they had completed pledge sheets and to please come pick them up. We didn’t even know we had these sponsors. Crazy isn’t it. Often when non-profit groups set up committees for fundraisers, they assign someone the task of going out to get donations, sponsors or assistance from businesses. Immediately, that individual will make a list of all the biggest companies in the region and the major employers and corporations. Next, they visit a few or attempt to contact them to get the much needed help or money, and they are rejected or run into red tape and bureaucracy, unable to even get in contact with the right people at the company who might be able to authorize such assistance. Believe it or not small businesses proportionally give more to the local communities than any other group, including the churches, government or the corporations. If you stop and think about who supports all the youth sports and who is there for you when you really need them? It's often a small business person who is there to serve. Small business people are golden treasures of the community and it is important to assist their businesses when they help your non-profit group. In fact, you need to find a way to plug their companies, send business their way and give them special thanks. Many times the small business owner is struggling cash-flow wise and make great sacrifices in order to help, it is such selfless acts being paid forward that deserve our attention. Please, help the small businesses in your town and do not take advantage of them, because they give proportionally more than their fair share. Always, always offer to assist those small businesses that assist your group, offer to put their coupons or flyers into grab bags for participants, always mention them in the newspaper, be sure to write a letter to the editor thanking them; their business and the business owner by name. "Ask not what your local small businesses can do for your group; ask what your group can do for your local small businesses"
There is a right way and a wrong way to approach corporations for donations, sponsorship or assistance with your fundraiser. Often folks get a little frazzled and frustrated when trying to contact the right person in a company and they feel as if everyone they talk to is passing the buck, avoiding them or making it nearly impossible to get past the front office secretary. Believe it when I tell you that most companies field 100s of requests a day from non-profits for help of some kind, especially in times of economic hardship. Remember non-profits are amongst the first and hardest hit as the economy goes south and consumers stop spending and tighten their budgets. Now realize that sending out un-solicited proposals is not a wise idea, instead you need to talk to someone on the phone, make sure that is the right person and then find out what they are looking for in a proposal and what sorts of things that they are willing to fund. Then you send your professionally done proposal; Attention; Mrs. That Person. One excellent opportunity for a local non-profit group is to be on a first name basis with local and regional political leaders and the powers that be. Very often, one simple phone call to a politician at the city, county or state level can help streamline permitting for your event. It thus, pays to be involved locally in other events, chambers of commerce and perhaps have various members of your non-profit group sitting on committees that affect the community. Now, obviously we are not suggesting that you bribe anyone, after all how can you, non-profit groups need to raise money, not pay it out to politicians. However, by helping your local leaders credibility in the community, mentioning them often when interviewed by the media and thanking them publically for their support, well, you will find that support continuing for as long as they are running the show. So, consider how you can develop a win-win relationship with your local civic leaders and maintain those relationships for your mutual benefits.